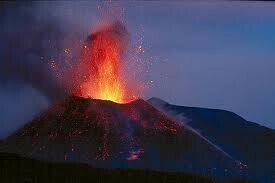 When a Composite Volcano erupts it shoots out lava rocks,ash,and hot gases! 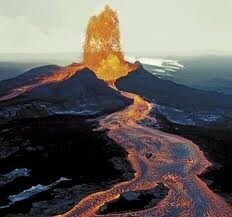 When a Shiled Volcano erupts and it shoots out hot bubbling lava and destory anything in its path! 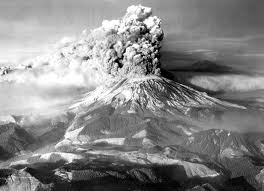 When a Cinder Cone Volcano erupts it shoots out ash, and thats how they form also, ash builds up on there sides and grow taller and taller every time a Cinder Cone erupts. A composite volcanco is built by hard layers of hard lava. They are taller then the sheild and cinder cone volcanoes. 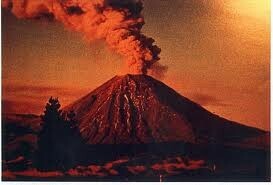 Composite volcanoes also shoot out ashes and flows out lava. 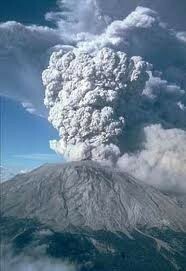 Composite volcanoes can erupt quietly or vioolently. 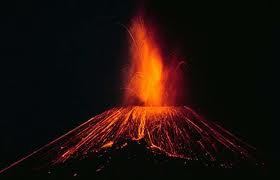 Both sides of the volcano are exactly alike.It is approximately one hundred to three thousand five hundred meters tall. Composite volcanoes are one of the most common types found.For example people living in langleg can see this type of volcano know as Mount Baker located in the south. There are three types of volcanoes Composite,Shiled.and Cinder Cone. Shield Volcanoes are made of thousand of thin basalt lava flows. Because the lava has a relatively low viscosity ( low resistance to flow ) the lava can traval far from the vent, the location where the lava reaches the surface. The resulting volcanic landfrom has a broad base and very gentle slopes, much like a warrior's inverted shield. Cinder Cones are mounds of basaltic scoria that are fromed by streaming gases, which carry lava into the atmosphere to from lava fountain's. The lava blobes commonly soildify during flight through the air before landing on the ground. If gas pressure drops, the final stage of building a Cinder Cone may be a lava flow that breaks though the base of the cone. Cinder Cones can occur alone but commonly occur in groups or fields. 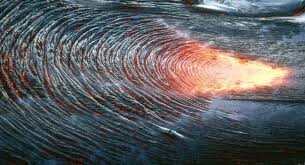 Aa lava flows form when basalt lava flows down the side of a volcano and is cooler than pahoehoe lava flows. The lava flow has a rough or rubbly surface with sharp edges. 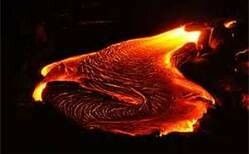 The Hawaiians first used this term to describe these type of lava flows on their islands. The rocks in the lava flow where unstable and had sharp edges that could easily cut a foot when walked on with bare feet.